On An Overgrown Path: Who needs a music director? As Dylan said 'The times they are a-changin''. And it's not just in the financial sector. As one major orchestra allegedly gags the press to protect its music director another ensemble is showing the way with a new programming model that jettisons the role of music director and rethinks the creative process. 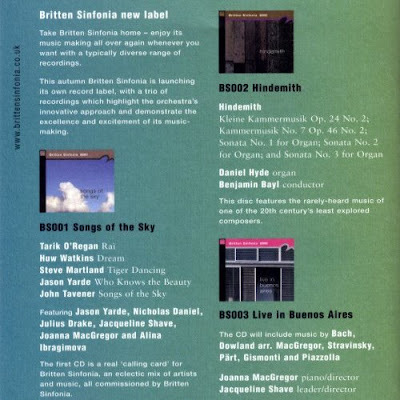 Since 1992 the Britten Sinfonia has built an enviable reputation for innovative programmes and high artistic standards and the ensemble has featured on these pages several times. And it has all been done without a music director or principal conductor. The Britten Sinfonia is not positioning itself as a conductor-less orchestra in the style of the Orpheus Chamber Orchestra or the post-Toscanini NBC Symphony. In fact far from it; the artists who have conducted, directed or played with the Sinfonia in recent seasons include Pierre-Laurent Aimard, Thomas Adès, Angela Hewitt, Masaaki Suzuki, Pekka Kuusisto, Nitin Sawhney, James MacMillan, Ian Bostridge, Joanna MacGregor, Gil Goldstein, Imogen Cooper, Alina Ibragimova and Stephen Layton. But the Sinfonia refuses to be subservient to a music director, and instead places emphasis on the development of its players and chooses to work on a project basis with a range of collaborators selected for their skills in specific fields. The creative health and confidence of the Britten Sinfonia is shown by its latest venture. The business case for launching a new record label right now must be about as strong as that for creating a new investment bank. But, as is their style, the Sinfonia are doing it their way. Not for them yet another recording of mainstream repertoire by a music director who has found himself ditched by a major label. The first three CDs on the Britten Sinfonia's own label are scheduled for launch this autumn. They are seen above and comprise the very repertoire that the big labels are now too frightened to touch. The Sinfonia's investment in commissioning new music is captured in Songs for the Sky which features their commissions from Tarik O'Regan, Huw Watkins, Steve Martland, Jason Yarde and John Tavener. Another CD reflects their commitment to exploring the twentieth-century repertoire with an all-Hindemith disc of Kleine Kammermusik Op. 24 No. 2, Kammermusik No. 7 Op. 46 No.2, and the Sonatas 1 to 3 for organ. Finally there is a live recording from the Britten Sinfonia's 2007 South American tour with Joanna MacGregor directing and playing Bach, Stravinsky, Pärt, Gismonti, Piazzolla and Joanna's own arrangement of Dowland. The Britten Sinfonia tell me that the first three releases on their own label are now scheduled for release in February 2009.